U3401-PB-PK is rated 5.0 out of 5 by 4. This Adjustable Shower Arm Mount for Hand Shower in Stainless, combined with a hand shower (sold separately) is a quick and easy way to update your shower. You can count on Delta reliability throughout the home, including our accessories and repair parts. We back each and every item with our lifetime limited warranty. Rated 5 out of 5 by Frankie from Worked perfectly I bought this to switch from a fixed shower head to a hand held. Worked perfectly. Rated 5 out of 5 by Racer from Replaced broke shower mount I ordered this to replace my original shower mount and the new one is better than the original. Part shipped quickly and a great price. Rated 5 out of 5 by savvy shopper from Exactly what I needed Easy to install - holds the shower head purchased separately & doesn't leak. What more do you need? Rated 5 out of 5 by Gloryde from Good quality You get a better quality fixture buying individual parts to make the whole. Will it make my Delta handheld easier to use? I recently bought &amp; installed Delta model 59345-PB-PK. But the added height of this handheld unit (versus where the old sprayer was) almost backs me up against the back wall of the shower because of the angle. Will this adjustable mount alleviate that problem? Is this item made of plastic or metal/brass? Will the holder accommodate most handhelds? Thank you for your question. 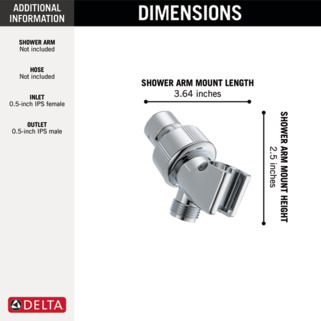 Delta Faucet model # U3401-PB-PK is non-metallic. 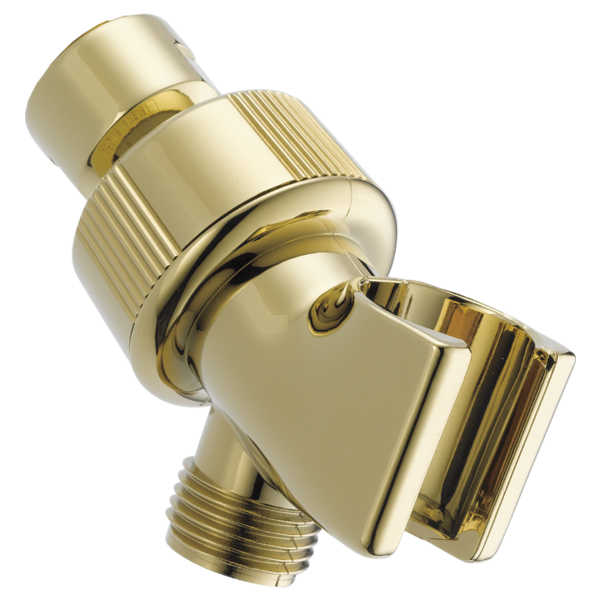 It is designed to hold the standard handheld shower and all Delta Faucet handheld showers. How do you adjust this? I would like the handheld shower to point in a downward position but do not see any directions on how this is adjusted. Can this part be purchased from Delta Direct? Thank you for your question. We do not sell directly to consumers. You can order and purchase Delta Faucet model # U3401-PK from your local retailer or wholesaler. Is this item available in polished nickel or polished chrome? Can you tell me if this arm will accommodate a former product from Delta (it may have been discontinued)? The number is/was RP14990. Many thanks. Thank you for your question. Delta Faucet model # U3401-PK will accomodate any standard Delta Faucet hose assembly. What is the inside diameter of the wand holder? My current wand tappers from 3/4&rdquo; to 1&rdquo; will your wand holder accommodate this was Done?